When Sloop originally approached me, it was to write some product descriptions. He had read my work on Women Who Live on Rocks and wanted to see what I could do for the tone of his brand, citing The J. Peterman Company as a source of inspiration. 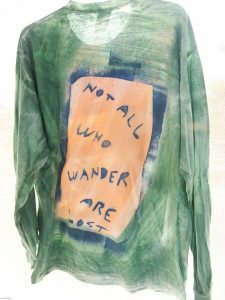 “It makes so much sense for Sloop to create his own version of this classic and versatile hot weather shirt for men, that we’re still scratching our heads as to why it took him so long to get around to it. 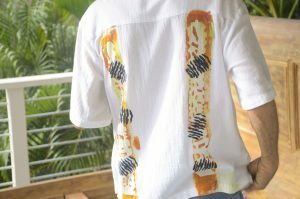 Sloopification comes in the form of two stripes painted down the front and back of the shirt, following the Guayabera shirt signature detail of dual vertical embellishment. Made of 100% cotton, the gauze weave is light enough to allow for plenty of ventilation while still keeping the shirt’s contents a relative mystery. 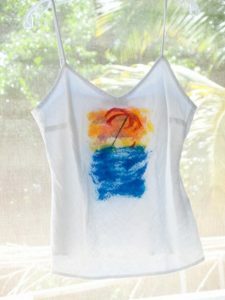 “Every woman needs a classic warm weather top that can be dressed up or dressed down. Something fun….like summer is supposed to be. None of this boring white, beige or black business. Something that will maintain its quality season after season without going out of style. Something that’s comfortable. And flattering. Something authentic. Hand-made with a great backstory. A conversation starter, even. Not to mention…something she’s unlikely to see on any of her girlfriends, colleagues or neighbors. (Unless she lives on St. John, that is). The Sloop Jones Cami is all this and more. This summer top is timeless, ageless, comfortable, versatile, hand-painted, 100% linen, machine-washable, flattering on everyone, and FUN. “You know that special guy in your life? The one who’s somehow both a thrill-seeker and a totally laid back dude at the same time? The one who still has a sense of adventure? The one whose wanderlust didn’t go away when it was time to grow up? The one who likes to live like a local when he travels? The one who requires a little color in his life? You know that guy, right? Well, we just wanted to let you know that he needs this shirt. I actually had to write two different descriptions for The Rainbow Room vacation rental. Without doubt, it’s an easy place to write about. Writing about it twice without repeating myself, that was the challenge. 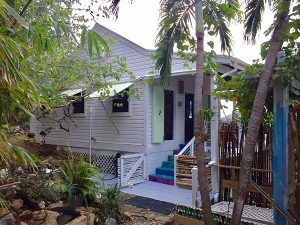 “An inspired vacation space for one or two, The Rainbow Room is on the quiet, away-from-it-all East End of St. John, sharing the same magical piece of property as the famed Sloop Jones Studio & Gallery. A stand-alone guesthouse surrounded by lush flora, this breezy one-bedroom has a spacious bathroom, kitchenette, and large porch. The water view is palm-treed perfection with the hills of Coral Bay in the distance. There is simply no place else in the world like this one. The Rainbow Room is in a building separate from the Sloop Jones studio, gallery and main living space. With high ceilings and many windows, the space is always beautifully lit by nature. Your starlit view from bed may very well bring tears to your eyes. Decorated as a soul-driven labor of love by the artist with help from his rainbow-making friends, this room is, indeed, like being inside a rainbow. The grounds are an ode to the spectrum of color made by nature. The gardens, a gallery of tropical flora that include orchids, bougainvillea, aloe, frangipani and exotic bamboo. The vivid color attracts butterflies, hummingbirds and other charming creatures. You are especially lucky to stay in the Rainbow Room when the jasmine or ylang ylang is in bloom. So heady and romantic is the fragrance that you immediately understand how Mother Nature is, indeed, the most indulgent and sensual artist of them all. St. John’s East End is a place that appeals to independent spirits, nature-lovers, and people who really love to have some space. The least-populated area of St. John, there aren’t even any roosters this far out. But there are plenty of donkeys. And goats. In fact, if we forget to shut the gate, they end up at our front door. The East End offers uncluttered exploration…. roads to ramble, private beaches to scramble and all sorts of sky to appreciate. You get the daily rise and set of the sun and moon. And a starscape that really does take your breath away. You will definitely need to rent a vehicle. A three minute walk and you’re at a secluded, private beach. A 15-minute drive and you’re in wonderfully wacky Coral Bay.”>Want to go to the North Shore? Give yourself a good 30 minutes. You’ll need 45 to get to Cruz Bay. But the beauty of driving on St. John… it’s all eye candy. 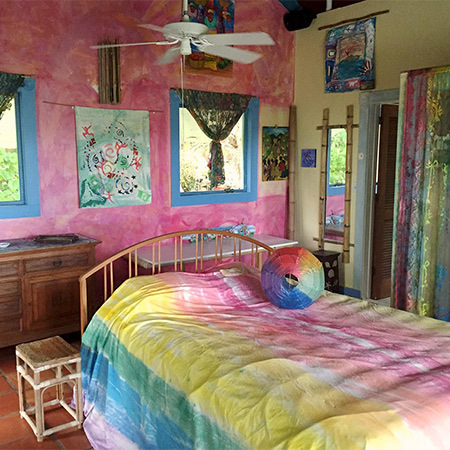 “Commune with nature and art in The Rainbow Room by Sloop Jones, a quiet retreat on St. John in the US Virgin Islands. The Rainbow Room is a spacious one-bedroom with high ceilings and tons of natural light, a large bathroom with shower, a kitchenette, and a large porch with screened in area and blissful water view. The Destinations magazine is given out for free (sometimes even personally handed-out) at the airport gate for flights arriving into St. Thomas. It has a huge distribution and has been around for a long time. 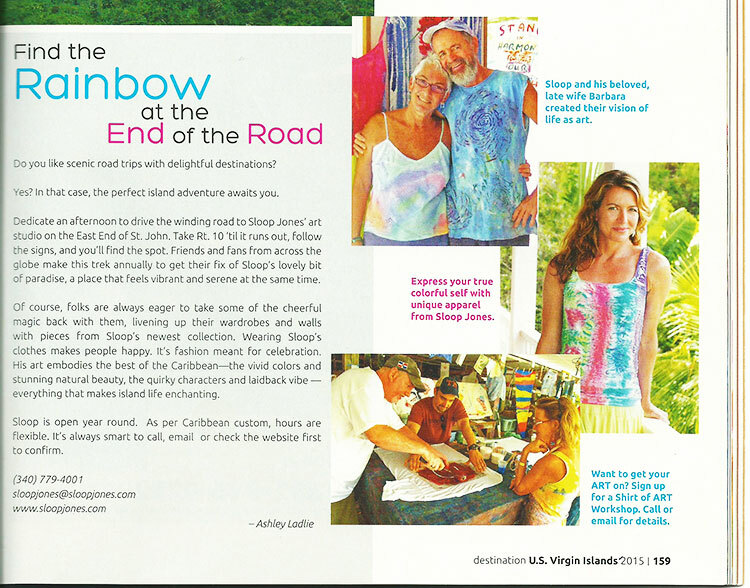 This advertorial ran in the 2015 and 2016 volumes of Destinations.